8 Slot Oak Tray 11"W x 10"L x 1"
Grizzly H8207 - 8 Slot Oak Tray 11"W x 10"L x 1"
Keep cutters and tool bits organized and protected with this felt lined solid oak tray with permanent dividers. This 3/4" deep tray has 3/8" thick sides and 3/16" thick dividers with stable 5mm thick MDF bottoms.Overall size: 10" L x 11" W x 1"Compartment Size: 9-1/4" x 1" x 3/4"
Keep cutters and tool bits organized and protected with this felt lined solid oak tray with permanent dividers. 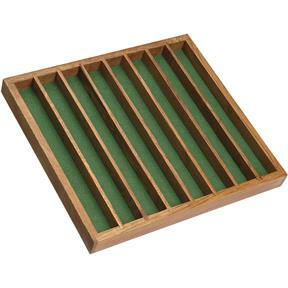 This 3/4" deep tray has 3/8" thick sides and 3/16" thick dividers with stable 5mm thick MDF bottoms. Overall size: 10" L x 11" W x 1"
Compartment Size: 9-1/4" x 1" x 3/4"